Two concurrent conferences and a surprise appearance by a top Apple exec make WWDC week more of a community celebration than ever. There was a time when Apple’s Worldwide Developer Conference (WWDC) was a sleepy affair, with plenty of tickets available and no lines to get in to most sessions. But as Apple has grown, the event has transformed into the biggest single event on the calendar of Apple events. Remarkably, as WWDC’s popularity has exceeded the capacity of the event itself, the event has still managed to find a way to grow. It started as a quirk a couple of years ago, but it’s turned into a full-blown trend: Hundreds, if not thousands, of people who work in Apple-related fields or just love Apple stuff, flock to San Francisco for WWDC week even if they don’t have a ticket to the event. It wasn’t always this way. In the last decade I clearly remember organizers of various conferences attempting to build events that would run alongside WWDC. The idea was that if Apple developers were in town for the week, perhaps IT professionals or designers or marketing people could come along, and go to their own conferences alongside Apple’s. It was a good idea, but Apple hated it. And so the company used its clout with Moscone Center to get local hotels to refuse bookings for competing events during WWDC. Maybe Apple was afraid that WWDC would no longer be the focus of the week and might actually be diminished as an event—but if I had to guess, I think the Apple of that era was paranoid about any other group or company riding on Apple’s coattails, even if such events might have actually been a net positive for the Apple community at large. There’s been a lot of talk about “the new Apple” lately, which generally describes the changes we’ve seen in how the company presents itself to the world under Tim Cook’s leadership, and following the departure of longtime communications head Katie Cotton. I’m not sure Apple has thrown away its playbook, but it certainly seems to be revising it. There was plenty of evidence of that this week in San Francisco. There is still value in a community gathering together in person. This week, running alongside WWDC, were not just various parties and get-togethers sponsored by various groups, but actual conferences running in parallel with Apple’s conference–and while they weren’t exactly endorsed by Apple, neither were they crushed like a bug so that Apple could be the only game in town this week. For the last few years AltConf has run alongside WWDC, providing interesting Apple-related speakers. This year, the conference also streamed the Apple keynote to attendees who couldn’t get into the room. Even there, a potential conflict with Apple over a public showing of Apple’s content was resolved amicably. Branching out from conferences for developers who aren’t at WWDC, this year saw the launching of the new Layers conference, organized by Jessie Char and Elaine Pow. Layers was a midweek conference pitched at designers, making it a good complement to WWDC by reaching a somewhat different, but related, audience. Layers was held around the corner from WWDC in a new event space at the Westfield shopping mall, and the vibe was similar to that at many other Apple-themed conference I’ve attended, with one big difference—instead of being a small collection of interesting people off on their own, it was a small collection of interesting people in the middle of an even larger set of events. Another interesting event, as well as an indication that we are indeed looking at the new Apple, was John Gruber’s annual live version of his interview podcast, The Talk Show. In past years John has interviewed other members of the Apple community, including developers as well as fellow writers and podcasters. 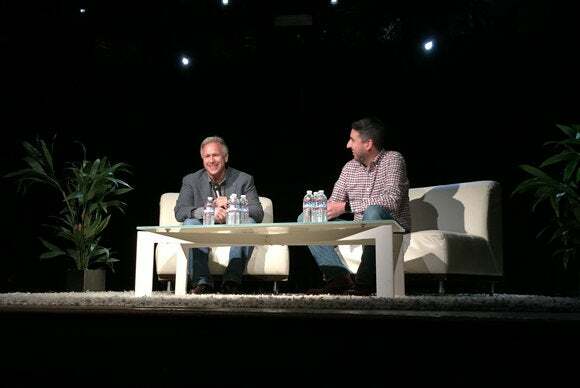 This year, his guest was Apple Senior Vice President of Worldwide Marketing Phil Schiller. Apple employees are all over San Francisco during WWDC week, in bars and restaurants and both inside and outside of the Moscone West convention hall. But to see Apple’s marketing chief at an outside event during WWDC week just felt… momentous, somehow. As if Apple is not just willing to allow this event to expand beyond the traditional borders of WWDC, but willing to accept, support, and even participate in it. During the final few years of Macworld Expo, the event’s organizers tried to do something clever and make the week of the event more of a festival celebrating Apple and the Apple-related community. I’ve been thinking about that a lot this week, because I think that it’s finally happened—but around Apple’s developer conference, instead. Given the apparent success of AltConf and Layers, I suspect we may see even more events spring up around WWDC in future years, and I think it’s a good thing. There is still value in a community gathering together in person, in putting faces to names and seeing people you haven’t seen in years, and in chatting with your voices instead of via text on Twitter or in Slack.